Uno Foods of Brockton, Mass., is recalling approximately 1,881 pounds of ham and cheese calzones. Although the product is labeled as a ham and cheese calzone, it contains a buffalo chicken calzone. Cases of 8-count packages containing 6-oz. 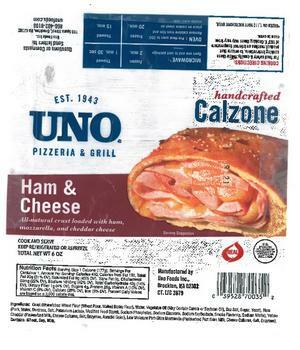 individually cello-wrapped “UNO PIZZERIA & GRILL Ham & Cheese handcrafted Calzone” and have a “Best if Used By” date of May 1, 2019, and a “8121” package code. The recalled product, bearing establishment number “EST. 17426” inside the USDA mark of inspection, was distributed to retail stores in Chicago and Texas. Consumers with questions about the recall may contact Lauren Ares at 1-866-402-6105, or by email at lares@unos.com or at 1-866-402-6105.